We are often asked how our wool is treated against moths, and whether it’s possible to purchase the treatment from us. All our Herdwick wool for Chimney Sheeps is plasma treated with Ionic Protect, which changes the ionic charge of the wool and means that the clothes moth no longer recognises it as wool. It’s genius, it’s 100% chemical free, and it lasts for the lifetime of the product. We are very happy to be using it. Read more about it here. In the past, our Chimney Sheeps were treated with borax. This is actually a fire retardant that coats the wool fibres. The borax consists of tiny sharp crystals that cut the clothes moth larvae when they try to eat it, causing them to perish. It’s not kind but nor are they. And it was the kindest-to-the-environment product available to us. Most commercial felt products were treated with permethrin, which is a synthetic insecticide that kills all insects. It is long-lasting so if the wool products get into the eco-system then they are poisonous to beneficial insects like bees and butterflies, and lethal to aquatic animals. The permethrin is also hazardous to humans, so for staff and customers alike who will be handling the Chimney Sheep it’s best to avoid using permethrin. However this has now been banned so the principal treatment available to treat wool has been borax in various forms. Our research has led us to find out a lot about clothes moths and natural products that are effective against them. We thought we would add these to the range of products we offer. But first you need to know a bit more about moths and the products available, in order to conduct an effective campaign against them. There are two main species of moth and one species of beetle that eat wool. There are a few other scarcer fabric-eating moths, but they all behave in a similar manner. Some of the literature refers to carpet moths as a different species but really all the wool eating moths will consume wool carpets and clothes with equal relish. It is in fact the larvae that eat the wool; the adult moths don’t feed once they’ve emerged from the pupae form as they are too busy breeding and then looking for somewhere to lay their eggs. All of them lay eggs on things that contain keratin to provide nutrition for the larvae when they hatch. This includes wool, silk, feathers, fur and hair. They can even eat leather. They avoid materials like cotton and synthetic fibres unless it’s blended with something they can eat. When they’ve eaten enough they form a pupa from which the adult moth emerges. This cycle can repeat itself several times within their breeding season. This is the commonest wool eating moth. It is a dusty gold colour, and is a tiny little thing, being between 6 and 8mm when fully grown. The males tend to flutter about looking for a mate, and the females tend to crawl around looking for somewhere to lay their eggs after they’ve mated. However they will fly as well. They avoid the light and will keep to dark and undisturbed parts of the house. Unlike most other moth species, they tend to avoid flying towards lights, and so cannot be trapped using an insect light trap. Although these moths are chiefly seen in the early summer and autumn they may be found at almost any time of year. The larvae are an off-white colour with a brown head, up to 10mm long. When they’ve finished feasting they spin themselves a cocoon in which they form a pupa and metamorphose into a moth. This moth has larvae that spin a distinctive silken case in which it lives. The head and foreparts of the larvae protrude as it moves about, dragging the case with it. The adults vary in length from about 4-12 mm. The fore wings are dusty brown with three blackish spots. The moths may be found most commonly from June to October. The adult has a wingspan of 10 to 16mm. This was considered rare but a recent project by English Heritage found increasing numbers of the species particularly in southern counties, and it may be that with climate change this species may be on the increase. The adults vary in size but are normally 8-12 mm and have greyish brown wings with dark marks at either end. The adults may be found from June to October. These are more scarce than the other species. This species will fly towards light traps, which the others do not. This species is quite rare, but has a preference for courser wool fibres such as those found in carpets, rugs, and horsehair. These beetles vary in size from 1.7 to 3.5 mm. The body is rounded, almost spherical. The larvae are 4 – 5mm in length and covered in hairs which give them the nickname “woolly bears”. This makes them sound cute BUT THEY ARE NOT. They specialise in devouring woollen fabric inside musical instruments for some reason, but they also favour any wool or keratin-containing material in a dark, undisturbed areas. Know the products – deter or kill! Anti-moth products do two things: deter adult moths; and kill moths, their larvae or their eggs. The deterrents are usually the least toxic; these emit different smells or chemicals that deter the female moth from laying her eggs in that particular location or on that particular garment. However a deterred moth is a determined moth and she has got a load of up to 200 eggs that she needs to drop somewhere. So I’m afraid it’s time to be ruthless and take her out, before the eggs hatch into 200 wool munching monsters. We have a product that is made of an extract of chrysanthemums, which the artificial permethrin mimics. This is lethal to adult moths, and their larvae. 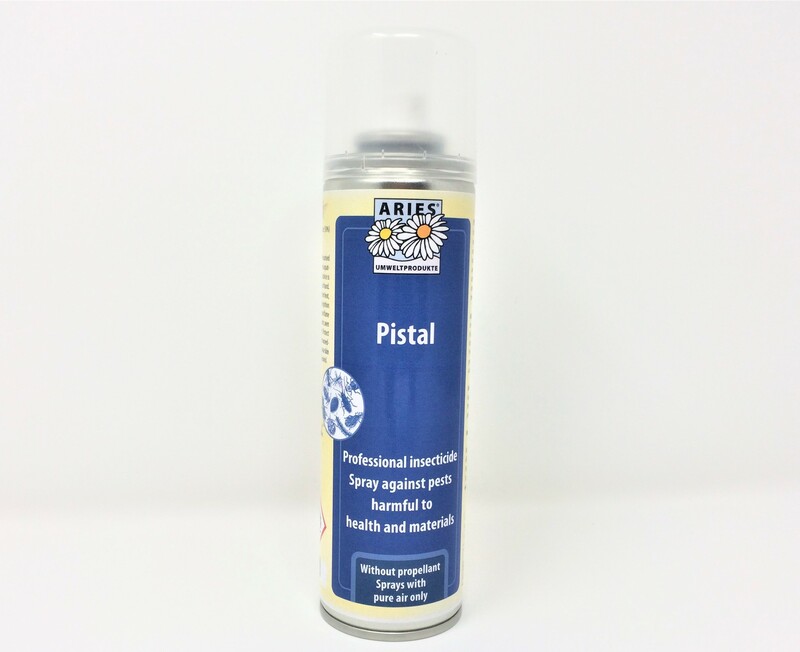 “Pistal” is also lethal to all insects so it must only be used with caution indoors. Unlike synthetic permethrin, it becomes inactive after two to three days, so can be used safely for a targeted blitz on moths. If you see a clothes moth, I’m afraid you have to kill it. You must check to make sure it’s a clothes moth first, but if it is, KILL IT. If you put it outside it will become a homing moth and come straight back in. You can just squash it or squeeze it in a tissue and put it in the bin. They are easy insects to catch by hand. The females can be a bit stealthy though so if there’s an area where you think they are likely to be such as under furniture about to eat your lovely wool carpet then give it a squirt with PISTAL professional insecticide. This is lethal to moths and all insects, but degrades after two to three days. This is so easy it’s almost fun. You set a pheromone trap with sticky paper. Poor old male moth is flying around looking for a female to mate with. It’s the males that fly about and the females that tend to crawl on the ground, though they clearly manage to fly up to wardrobes. Male moth thinks he’s caught the scent of a beautiful lady moth, flies up for a closer look, and wham! He’s stuck on the fly paper. It’s not kind BUT NOR IS HE. The pheromone traps last around 12 weeks so it’s necessary to replace the insert every 12 weeks throughout the breeding season June to October. Pheromone moth trap with a number of small golden moths stuck to it and dead. Dead moths. There are a few things to do here. One is to wash everything on a wool cycle. This will remove any eggs. Use a fabric conditioner with lavender to deter future lady moths. Deterring isn’t as effective as destroying but it’s all part of the battle. Dry clean items that can’t be washed in the machine – moths avoid the smell of dry cleaning fluid so once they’re cleaned they should deter moths. Another technique is to put your woollens into a freezer for a while. This will effectively kill all the eggs. The third option is to clean everything very thoroughly everywhere there may be wool. This includes your wool rugs and carpets, under the furniture, underneath the rugs, in your sock drawers, (real silk underwear? Better clean that drawer too!!) in fact have a proper old fashioned spring clean. Moths and carpet beetles hate light so exposing them to the light and shaking out rugs and furnishings will dislodge any eggs and remove any larvae that may have hatched. Remember to throw away the hoover bag after you’ve finished or if you use a bagless vacuum empty the contents into a bag and seal it before you put it in the bin. Finally, if you pack winter clothes away in the summer, take them straight from the line to storage with no option for Mrs Moth to gain access. Pack them with scented deterrents just to be on the safe side. I love the lavender fabric conditioner as this makes them smell nice to us and bad to the moths, whereas a lot of mothballs on the market are unpleasant smelling to people and moths alike. 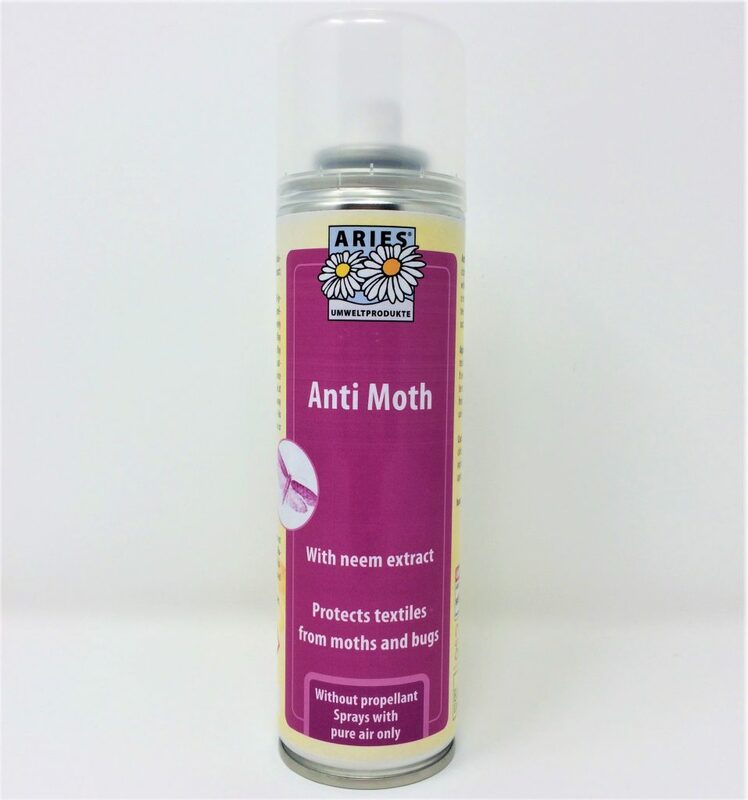 For non-clothes items, or to be extra-careful with your favourite wool pieces, we have Anti Moth spray with Neem extract. This lasts 6 months and is a powerful moth deterrent while having an odour that is considered pleasant by most humans. After all that and you’ve still got doubts about your favourite wool suit, or it’s been to the cleaners and back and you’re worried it might have been re-visited by Mrs Moth, then give it a spray with Anti Moth and hang it up in the light. Clothes moths avoid the light so if the eggs hatch the larvae will try to get to somewhere dark. So check the pockets and under the collar regularly. It sounds paranoid but it’s just being careful. Moth eggs hatch after 4 to 10 days so if you keep it hanging for a fortnight, well moth-deterred, and no larvae appear then you should be confident that it is safe. These have just hatched from their egg and they are hungry. Some treatments, like the borax we used to use, is poisonous to the larvae. They have to eat a little bit of it in order for it to kill them. This is fine for something like a Chimney Sheep which can sacrifice small amounts of wool but not a good way to treat your finer woollens. Our Pistal professional insecticide is made from an extract of chrysanthemums. If you have a serious infestation then it’s recommended to spray all potential moth sites then seal the room for it to take effect. Remember to close the chimney as well. And please keep the window closed. This stuff is for killing a household pest, not the beneficial insects or their predators up the food chain. And use a face mask! 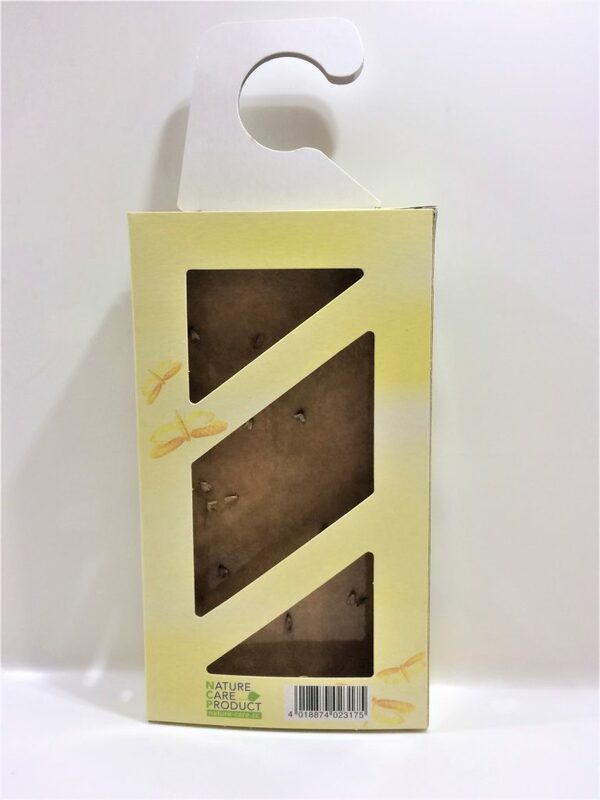 It’s tempting to throw the full armoury of moth products at the pests in one go and hope that one or the other will do a combined effort in destroying and preventing them. However if the male moth scents the pheromones of a gorgeous female moth, and at the same time gets wind of the revolting stench of lavender then he will be extremely confused, poor fellow. Use the pheromone trap as part of the catching phase, then use the deterrents once you’ve blitzed the place for moths. As an on-going defence, use deterrents on your wool garments and have the pheromone traps strategically placed to monitor for moth returns, but keep the two products in separate rooms so as not to send out conflicting messages. How do moths get into the house? Clothes moths are tiny, and can get in through the smallest of gaps. They will flutter in through open windows, through vents and holes in the building, and down chimneys. They seek out dark places so the chimney is an ideal route in. If there are birds’ nests at the top, lined with wool and feathers, then it’s easy for them to them to get in that way. The Chimney Sheep will offer a line of defence against them but it’s a good idea to keep good chimney hygiene and get it swept annually even if you don’t use it. It’s also important to fit a chimney bird guard to prevent birds from nesting in the top of the chimney. We love birds and encourage them to nest everywhere else, and have nest boxes around the factory, but bird nests in chimneys are problematic. Do all moths eat clothes? No way! There are thousands of species of moth and only three of these eat woollen garments in the UK. Clothes moths are actually very useful out in the wild as they eat owl pellets, old nests and other things that would take a lot longer to biodegrade if the moth larvae didn’t help. The pheromone trap only attracts clothes moths, whereas the spray is an insecticide against everything. So make sure you’re only killing the bad guys. All the other moths are good guys, and help us by pollinating flowers and other useful activities. So do the pheromone moth trap test, and make sure it is clothes moths or case-bearing moths that you are targeting. 3/ Destroy any potential eggs by having a really thorough clean and shake out. 4/ Deter moths from coming back by hanging Moth Protection in the wardrobe and spraying items with Anti Moth neem spray. 6/ Monitor for the return of moths using the Mott Box pheromone trap. Keep this in a different room from the deterrents. Although it comes with a hanger it does not have to be hung in a wardrobe – you can even keep it discreetly under the sofa if you have wool rugs to protect, just remember to check it regularly and replace the sticky insert every 3 months. 7/ If you catch more moths then start again with 1 – 6. If it’s a warm summer then I’m afraid they will keep coming back in, it’s not that you’ve been unsuccessful. But if you have your valuables protected with active deterrents then it should not be as bad.